All! This Villa was really perfect. Great privacy. Super maintained and so clean! No really it was a pleasure to be there. Second time week booked this villa. And liking it again. We will come back. Spacious! Modern decor. Quiet. Own plunge pool. Easy to get taxis to other places. The villa was of a high standard & quality in excellent location for those of us wishing to be away from main resorts and busy hotel pool areas!! Roomy. 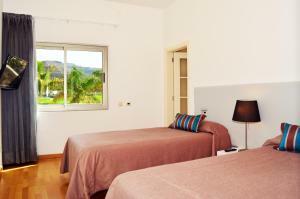 Very spacious modern and comfortable living areas , bedrooms and bathrooms. Excellent parking in a massive garage. Felt private despite the surrounding villas. Handy onsite supermarket. The villa was beautiful & the setting was tranquil. Loved that each room had its own large ensuite & was spotlessly clean. Lock in a great price for Villas Opal Anfi Tauro – rated 9.2 by recent guests! Villas Opal Anfi Tauro This rating is a reflection of how the property compares to the industry standard when it comes to price, facilities and services available. It's based on a self-evaluation by the property. Use this rating to help choose your stay! One of our top picks in Puerto Rico.The luxurious Anfi Opal villas in south-east Gran Canaria are less than 0.6 mi from the Atlantic Ocean. All have private swimming pools, hot tubs and plasma-screen satellite TVs. 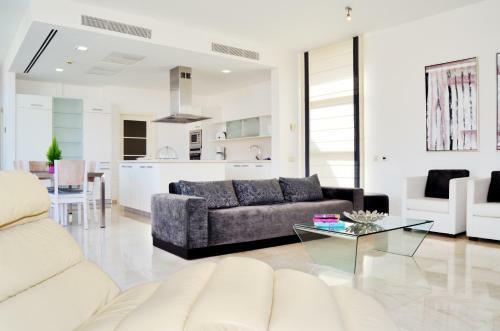 All the modern, air-conditioned villas feature stylish and minimal design. Each one has a large garden and a private terrace. The large, open-plan kitchens include dishwashers, microwave and fridge-freezers. There is also a large seating area with sofas, and all bedrooms are en suite. There is satellite TV in the bedroom and sitting room. VIllas Opal Anfi Tauro forms part of the Anfi Tauro complex, which also includes an 18-hole championship golf course and other related facilities. Guests enjoy discounted green fees. 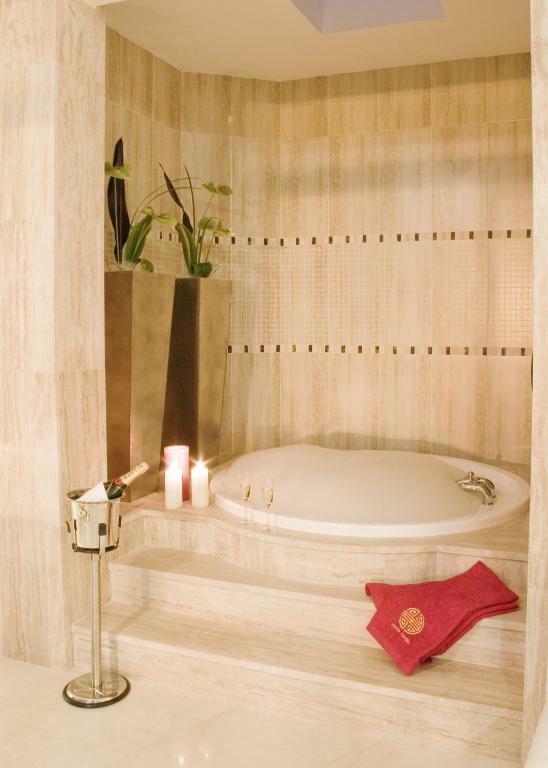 There are also on-site squash and paddle tennis courts, and a massage service is available upon request. Gran Canaria Airport is just 40 minutes’ drive away, while the resort of Puerto Rico is just 0.6 mi away. The Anfi Tauro complex offers free parking. This property also has one of the top-rated locations in Puerto Rico! Guests are happier about it compared to other properties in the area. This property is also rated for the best value in Puerto Rico! Guests are getting more for their money when compared to other properties in this city. When would you like to stay at Villas Opal Anfi Tauro? 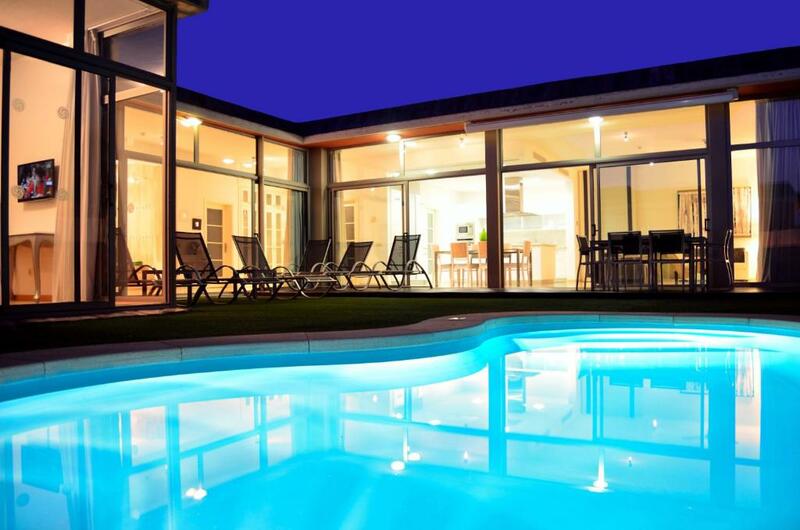 Located in a residential area, this stylish, modern villa features a private pool and a hot tub. 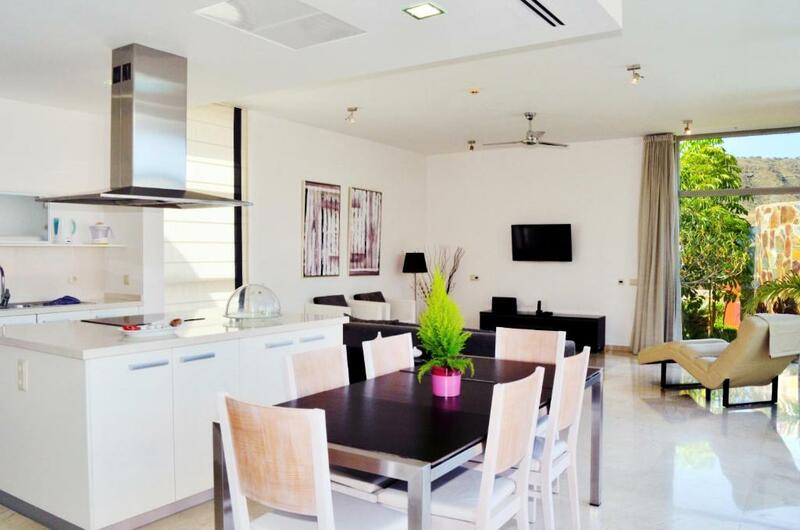 It has 3 bedrooms and a lounge with flat-screen satellite TV and a DVD player. The kitchen includes an electric hob, microwave, dishwasher and washing machine. Free WiFi is available. 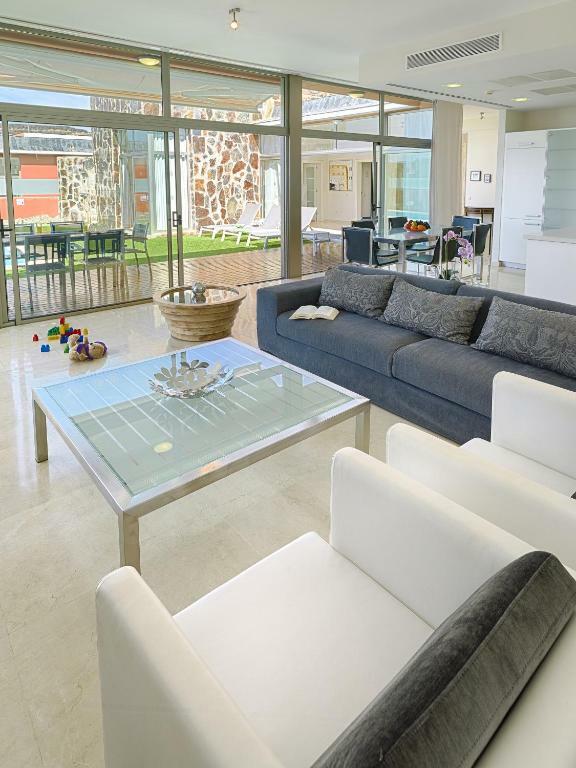 Located in a residential area, this stylish, modern villa features a private pool and a hot tub. 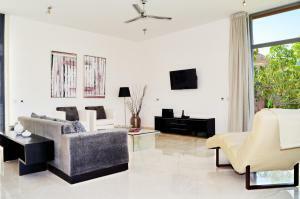 It has 2 bedrooms and a lounge with flat-screen satellite TV and a DVD player. The kitchen includes a hob, microwave, dishwasher and washing machine. Free WiFi is available. en nuestras villas encontrarás tranquilidad y buen servicio. Los clientes siempre son lo primero e intentamos que su estancia sea maravillosa. House Rules Villas Opal Anfi Tauro takes special requests – add in the next step! One child under 14 years is charged EUR 15 per person per night in an extra bed. Villas Opal Anfi Tauro accepts these cards and reserves the right to temporarily hold an amount prior to arrival. For arrivals after 5 pm and arrivals on Saturday or Sunday, key pick-up takes place in the Hotel Anfi Emeral Club, Calle Luxemburgo 4, located 650 feet from the hotel. Please note the villa's swimming pool can be heated for an additional EUR 15 per day. Sheets and towels are changed weekly. Please inform Villas Opal Anfi Tauro of your expected arrival time in advance. You can use the Special Requests box when booking, or contact the property directly using the contact details in your confirmation. We had to look a bit to find the check in reception but the friendly lady guided us by phone. We stayed in a villa overlooking the stunning golf course providing us with total privacy and a romantic location. The hotel provide a shuttle service to their other hotel resort on the beach if you wished a little more choice in restaurants or shopping. A very elegant vacation away from any rowdiness. We will be booking again for next February and hoping we enjoy the same beautiful weather we did this time. If I should say something...I would suggest to put some pillows / cushions in the summer beds. Without is hard and lacking back support. Property will develop a beach and harbor area in the next few years but until then the resort is quite isolated with only a couple of dining options (both very good). It’s best to have a hire car if you stay here so you can go elsewhere for more choices. Pool heating didn't work- In my opinion this was known before we arrived. Couldnt be fixed during our stay. We were told we had been moved from an appartment with a working pool but non functional Aircon.However the Aircon in the available appartment was very poor despite several attempts by staff to remedy ,it never worked well and the pool heating didn't work at all. No good for early morning and evening dips. Limited view but conversely nice and private. Heated pool wasn't working so had to change villas. Cockroaches were in the apartment. Loved the villa in general and will definitely return. Compared to the hotel, the villas had no access to activities, such as golf, pool, table tennis. There was a HUGE empty room downstairs, next to the garage which could have been put to some sort of use. Felt that a 4pm check in was a little late.